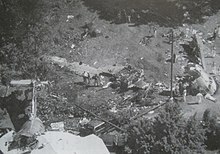 ^ 1.0 1.1 1.2 Aircraft Accident Report, Flight Into Terrain During Missed Approach, USAir Flight 1016, DC-9-31, N954VJ, Charlotte/Douglas International Airport, Charlotte, North Carolina, July 2, 1994 (PDF). National Transportation Safety Board. 1995-04-04 [2017-12-23]. AAR-95-03. ^ Racing the Storm. Mayday. 第1季. 2003. ^ Death Cheaters. The Unexplained. 1999.